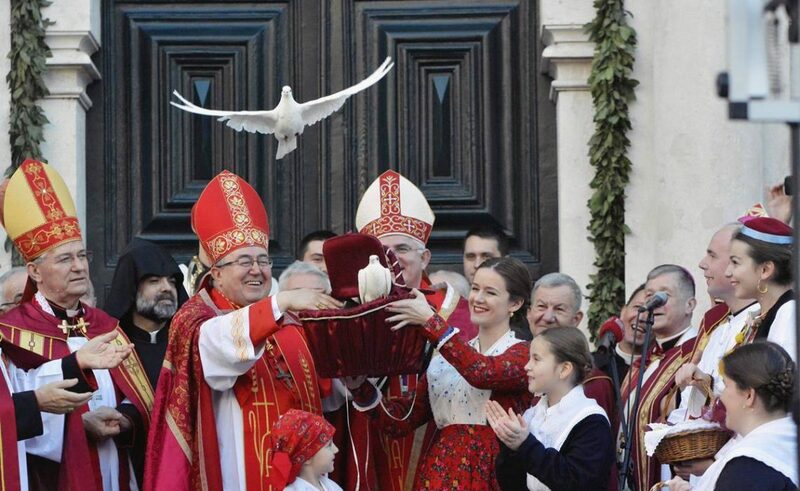 ‘A day that comes once a year’, the St. Blaise Feast has been celebrated for 1045 years in Dubrovnik. today, it began with the ‘Kandelora’, traditional Candle Mass opening of the ceremonies connceted to our beloved Parac – St. Blaise. It makes a direct connection with the tradition and history of Dubrovnik, which is reflected in each segment of this celebration. Tomorrow, February 3rd, is the Day of Saint Blaise, the patron of Dubrovnik, and also the Day of the City of Dubrovnik. Therefore, along with church ceremony, in the city under Srđ, there are organized a number of events of secular overtones that are dedicated to the Dubrovnik patron saint, who keeps Dubrovnik on his outstretched palm. For centuries, the festival has been unchanged, as well as the affection of inhabitants of Dubrovnik and its surrounding to their patron St. Blaise, his character and work that is woven into all aspects of Dubrovnik past and present. In 2009 this celebration was inscribed on UNESCO’s Representative List of the Intangible Cultural Heritage of Humanity. 12:00 pm Return of standard bearers to the City, lowering of the banner of St. Blaise, raising of the national flag, and holy mass with which the Festivity of St. Blaise for 2017 officially ends. What Feast of St. Blaise Means for Dubrovnik Tourists?